It’s at the top of many bucket lists and a must-see National Park. It’s the least favorite National Park because of traffic, crowds, etc. I agree Yellowstone can be a bit overwhelming due to its sheer size and popularity. However, the trees, animals, and geysers are there existing in a beautiful high energy no matter what. If you can tap into that and remember what you came for, then you won’t be phased by traffic, crazy tourist groups, or anything else. Stay connected to the amazing vibration that nature puts off, and follow these nine tips to keep calm and enjoy Yellowstone for the magic that it is. 1. Plan for the drive times. Yellowstone is humongous!! It takes a fair amount of time to get to all the sights in the park. This was something I didn’t realize before arriving at the park and looking at the maps, so I had to then take that into account for how much we could see in a day. Just to go from our campground at Fishing Bridge to Old Faithful was almost a 2-hour drive to go 38 miles! To get from Old Faithful on to the Grand Prismatic Spring was about another 30 minutes. I’m not complaining though because the drives are amongst some of the most beautiful scenery and the prospect of seeing wildlife will keep you on the edge of your seat the whole time. My partner and I are vegan, so this is incredibly important for us as we didn’t know if any of the lodges and restaurants would have vegan options. Also, we were walking and hiking a ton so we worked up an appetite! Our RV made it super convenient to cook meals and pack them with us for the day, but for those who don’t have that option, the park sells packed lunches. At the least, I would carry plenty of water and snacks with you. Trail mix, nuts, and granola bars go a long way if time gets away from you while exploring and you have a bit of a drive before you get to a lodge with food. Even if you’re not a morning person (ahem….like me), a trip to Yellowstone is worth waking up at the crack of dawn! There is so much to see and do, and starting early makes all the difference in maximizing your day. Plus, driving around Yellowstone before all the daytime tour groups come in makes for a peaceful start to your day. I think that no matter the time of year as well, it is a spectacular place in the morning when the cool air reacts with the hydrothermal features to create clouds of steam all over the park. 4. Be prepared for the weather for the whole day. Check the weather forecast ahead of time because you won’t have cell service in the park, although you can get the daily forecast at the Visitor Centers. Depending on when you go, the temperature tends to span a wide range making layers essential! The September mornings started off cold for me, but midday with the sunshine I was comfortable in a tank top. So, layer up and be prepared to shed and relayer as the day progresses. 5. Get off the beaten path at least once! Yellowstone is one of the most visited National Parks in the US, with the busy summer months getting almost 1 million visitors. The yearly average is around 4 to 4.5 million visitors, so you can imagine how crowded 1 million visitors in a month can feel if you stick to the most popular sites. However, Yellowstone covers 2.2 million acres of wilderness with tons of room to get away from the crowds and find solitude in nature. Even if you only take your packed lunch one day and find a secluded picnic spot, you will be glad you did. We followed signs to a picnic spot that took us deep in the trees to an empty parking lot. 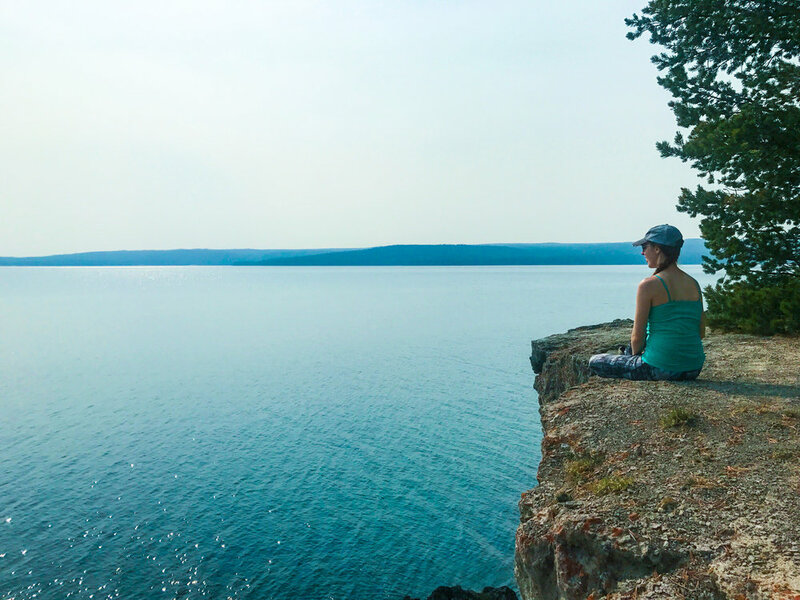 We took off on foot along the small trail away from the parking lot, which led us to a serene picnic spot on a cliff right on Yellowstone Lake. Nobody else was around, so it was incredibly peaceful to take in the magnificent view. 6. Make use of your phone’s airplane mode to conserve battery for picture taking. There’s no cell service in the park, so there is really no reason to keep your phone on. (If you do need to find cell signal, we noticed there is a weak connection at the Old Faithful Visitor Center.) Switching into airplane mode will conserve your battery as your phone won’t be trying to pick up on a signal. The longer your battery lasts, the longer you can go without needing to find power to recharge during the day. You always want to have a camera handy to capture one of the many awesome moments you’ll have in Yellowstone. For example, driving around a curve and spotting bison in the middle of the road—my phone was charged up and ready to capture that moment! 7. If you see a crowd of cars pulled over, stop and ask somebody what’s going on. It’s highly likely that there’s something cool to look at wherever there’s a crowd. We spotted a huge crowd when driving through Hayden Valley (known for wildlife sightings), and we parked on the side of the road and walked up to ask what everyone was looking at. There was a grizzly bear going for a swim in the Yellowstone River! A kind stranger even let us look through his binoculars to get a better look at the bear. If we hadn’t stopped though, we would have missed it because the bear was hard to spot off in the distance. 8. Obey the speed limit. The speed limit is always there for a reason, whether it is an area highly trafficked by wildlife or blind curves where you can’t see stopped traffic or things obstructing the road. If the speed limit drops from 45 mph to 25 mph, that’s a signal that something may be up ahead for you to be mindful of. We had a close encounter while towing the RV the day we left. We came around a curve and two large bison were walking in the middle of the road! Al hit the brakes and they were far enough out of our lane to be safe, but if we had been just a little bit earlier we might not have missed them because the RV doesn’t have the same stopping power in a case like that. Photo taken while driving, so not the best quality but it gives you an idea of the dangers of driving too fast in Yellowstone! 9. Be mindful of how much time you spend in the Visitor Centers. If you have time, visit the Visitor Centers because they have cool exhibits and a lot of great information. If you don’t have a lot of time in the park, focus on seeing the real thing outside instead! You can hold onto all of your Yellowstone park brochures and read them on your trip home. Also, I feel like it is obvious, but you will ruin your trip if you don't follow the rules in Yellowstone National Park. It's a beautiful place, but nature is not kind if you don't respect it. Don't leave the boardwalks and risk falling into a boiling hydrothermal feature. Don't take an illegal dip in the hot springs. And more than anything, respect the wildlife! It's their home and we are just visiting it. Keep your distance from all wildlife and don't feed them human food, for your safety and theirs. The National Parks will only be here for generations to come if we are mindful of our impact during our visit.